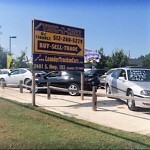 Leander Trux n Karz prides ourself by offering the quality used cars, trucks, SUVs, and vans. Leander Trux n Karz is a family owned and operated dealership located in Leander, TX that has been in business for over 15 years. Get financed today with our in-house BUY HERE PAY HERE payment plans. We are a CARFAX certified dealer and every car we sell comes with a free CARFAX vehicle history report.